First I must say that the photos are not mine. I surfed the net and found them. This review is for a discontinued tool. Can’t buy it new anymore, but if you find one, grab it. It is a rare tool. I bought mine on eBay a few years ago. It came with a Porter Cable router base that fits my 690. Even came with the optional Shopsmith stand. I got one heck of a bargain. Paid twice as much for the shipping as I did for the tool and still spent less then $100. It is a handy tool. Does a good job for cutting mortices and have used it for a variety of other configurations and special cuts. This tool was originally sold by the Strong Company and after Shopsmith purchased the rights to make it they took it into their R&D department and added dust collection and removed one lead-screw and the synchronizing bicycle chain. After a few years this tool was retired. There is one important thing that you need to keep an eye out for if you are shopping for the Shopsmith version of this tool. You’ll want to make sure that the plastic platen that moves the router up and down isn’t cracked where the knob that adjusts the backlash out of the lead-thread, threads into the platen. If you are buying one online ask the seller to tighten the knob gently and snap a photo of this detail from above. It it’s cracked, take a pass. Mine works fine and the dust collection is the best I ever seen for a router. Thanks for the review. I’ve never seen one before. i imagine it works well, but how safe is it to use? thanks for the review. 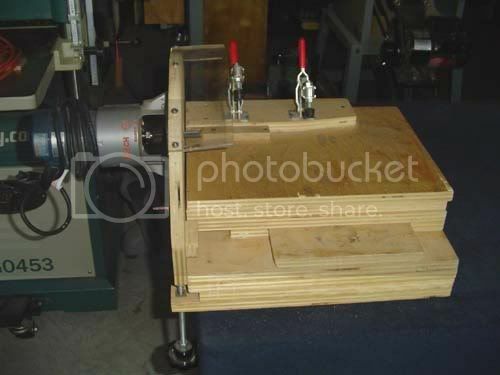 there is another horizontal router table that is now manufactured. if i can find the link i’ll post it. MLCS sells the same one as Eagle. Someday I’ll show you a picture of the horizontal router I made. This is the one MLCS sells. I recall considering one of these I guess close to twenty years ago, (complete guess). I never did buy it, and now I kind of regret it. Never seen one. thanks for the review. it has an exposed router bit. all I can say is I’m very careful and have never been hurt using it. If it doesn’t look safe or feel right … there is always another way. This is a horizontal mortiser I made, based on a plan by Yeung Chan. I modified the depth adjustment mechanism to use a bolt, instead of clamping to the work bench. I’ve used this for years and it works very well. The only thing different about it’s use is, you feed the work with the rotation of the bit, instead of against it. Other wise you get a lot of splintering. I made the sliding table a little tight, to prevent it from sucking the work into the bit. looks like something easy to make and use. I may have to take a crack at it. I also found a Shopsmith miter gage that fits the Joint Matic. ... Ebay ,, where else. I’ve also made jigs and special fixtures for different projects. My uncle use to have a shopsmith way back when (in the 1950’s and ‘60”s. He could change it into a table saw, a lathe, router, and I think it even jointed and planed smaller pieces. I remember, it was a fabulous machine, but every time you wanted to do something, you had to tear down that set-up to go to the other one…...then if you had to come back to that set-up…....whewww….what a waste of time etc. The beauty of the OPR is that it functions in the horizontal configuration also. Cool. Is this like the multi router that David marks uses? I don’t get why the horizontal-ness of it helps to do things, what is the main reason of haveing it mounted horizontaly? WSF, I think joinery (like dovetails) is a great function for the horizontal routing systems. You can see the work, it isn’t underneath your work piece. BTW, I received my Overhead Pin Router from Shopsmith yeasterday morning. When I get the opportunity, I’ll experiment with it in the horizontal mode.